T8SPORT treadmill of BH fitness is is a workhorse, driven by 3.5 HP continious motor and has various attactive features like comfortable handle grips, active flex suspension, whisper quiet motor, personal cooling fan, non-removable safety key etc. T8SPORT provides you enough space of 22″x60″ for a comfortable workout. Designed for Residential as well as light commercial purpose-It is strong enough to use be used for light commercial purpose. It is reliable and often used for residential purpose. Wisper Quiet Motor of 4.0 HP -Strong 3.5 HP AC drive motor provides durability and reliability. Its motor makes very low sound. MP3 Compatible - A unique features of it, to entertain you while your workout. Largest Running Surface -It has 22" x 60" wide running surface. Active Flex Suspension -Active Flex suspension technology allows for a softer landing and firm push off for comfort and efficiency. The latest cost of BH Fitness T8SPORT Treadmill will be updated soon. *Note: Most of the sites, stores or shopping portals listed above sell BH Fitness T8SPORT Treadmill with discounts and other exciting offers. 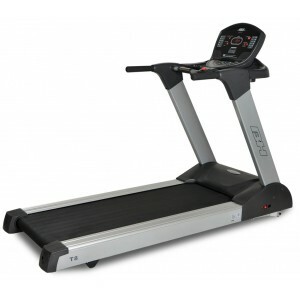 There is a possibility that the some of above websites are not selling BH Fitness T8SPORT Treadmill now. Toughtrain.com is not liable for such cases or instances. Also we do not recommend any seller for BH Fitness T8SPORT Treadmill and a buyer should buy from where he/she gets best deal with quality of products, service and on time delivery (shipment).